While I am sitting here listening to Jorge Drexler´s rendition of El Tiempo Está Después, I thought I´d tell you all about our recent jaunt over the Sierra Arana here in Granada. 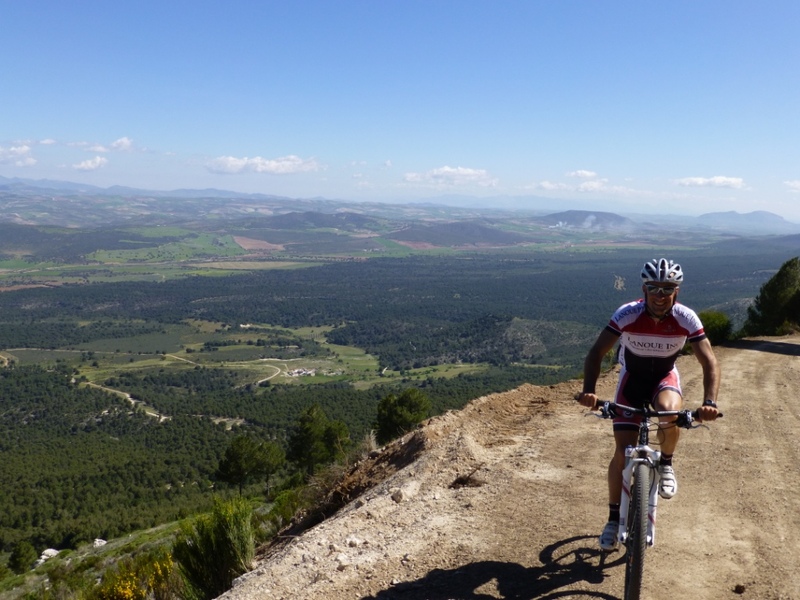 We´ve been trying to combine training with the discovery of new and different roads, or simply ride on the road less traveled that we haven´t been on before. We took the train to Iznalloz (after convincing them to let us on the train with our bikes! ), and set off from there. 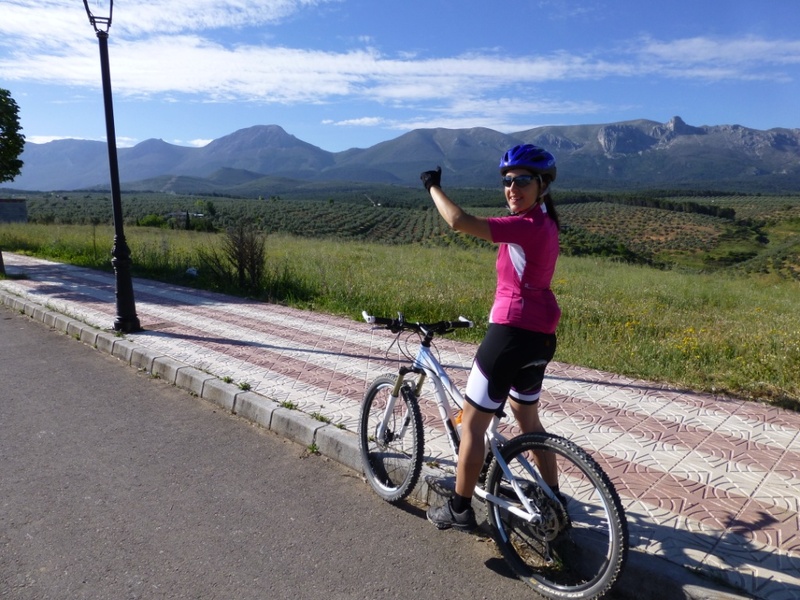 I loved the climb to Collado del Agua – it seemed as though the road itself helped me float up the mountain…I think, however, that Elsa would likely take issue with this statement. estando aquí sentado escuchando la interpretación de Jorge Drexler de El Tiempo Está Después pensé en contaros un poco nuestra excursión por la Sierra Arana aquí en Granada. 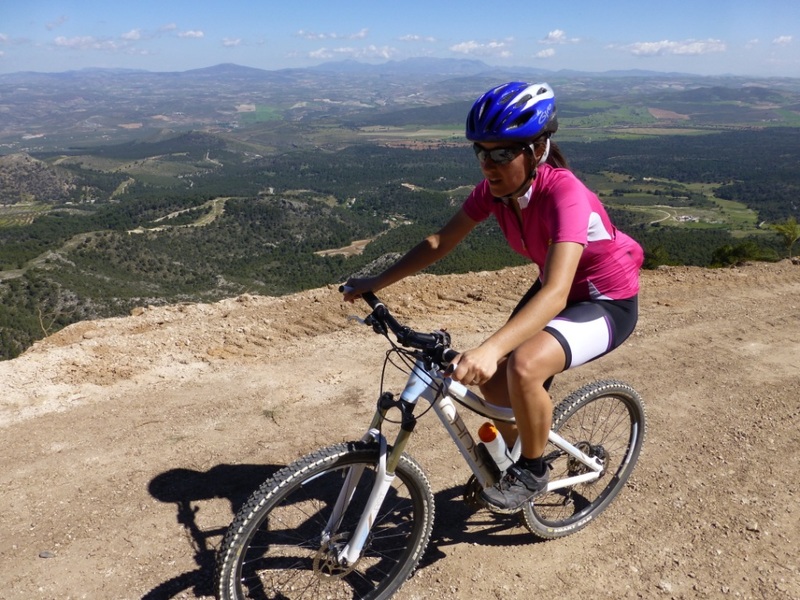 Hemos estado intentando combinar algo de entrenamiento con el descubrimiento de caminos nuevos y diferentes, o simplemente ir en bici en lugares poco conocidos en los que no habíamos estado antes. 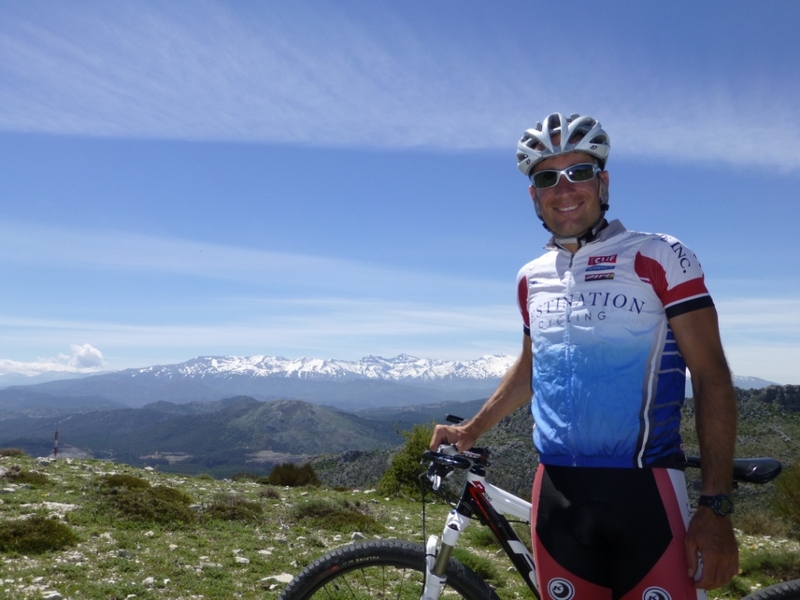 Below is a nice photo of the Sierra Nevada mountains in the background. Normally the snow is a lot less at this time of year. It just so happens to have been a wet winter here in Spain. Abajo hay una bonita instantánea con las montañas de Sierra Nevada al fondo. Normalmente hay mucha menos nieve a estas alturas del año. Pero éste ha sido un año lluvioso en España. Nobody minds climbing mountains when the views are good. We ran into some guys from Murcia who had hiked up the mountain. They didn´t look too fit, so we were rather perplexed. As we decended, though, we found their tour bus only a few kilometers down the road. Well-played, boys! A nadie le importa subir montañas cuando las vistas son buenas. Nos encontramos con un grupo de Murcia que habían subido la montaña. No parecían estar muy en forma así que nos dejaron bastante asombrados. Cuando descendimos encontramos su autobús a tan solo un par de kilómetros más abajo. Bien jugado chicos! We decided we had to pose for one of our final pictures with the great, majestic Sierra Nevada in the background. We´ll miss you, great white snowy wonder! Decidimos que teníamos que posar para una de nuestras últimas fotos aquí, con la majestuosa Sierra Nevada de fondo. Te vamos a echar de menos, fantástica maravilla blanca! 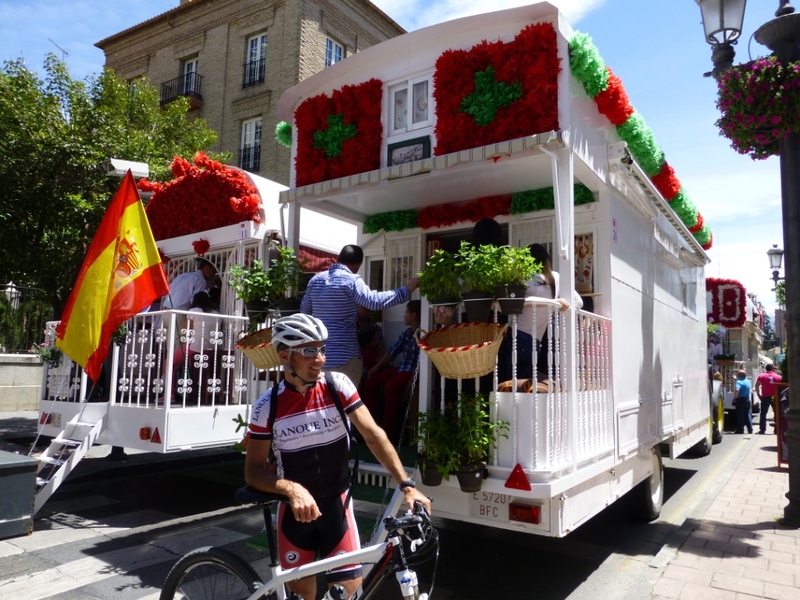 People put a lot of time and cash into these trailers in order to do the Rocío pilgimage. It was impressive. Clearly, some have escaped the crisis. The Spanish flag helps you remember which country you are in. The house on wheels is perhaps the new trend in homebuilding! La gente invierte mucho tiempo y dinero en estos trailers para poder hacer el camino al Rocío. Era impresionante. Está claro que algunos han escapado de la crisis. La bandera española sirve para recordar en que país seguimos. La casa con ruedas puede que sea la nueva moda en construcción! This woman above looks well-taken care of. 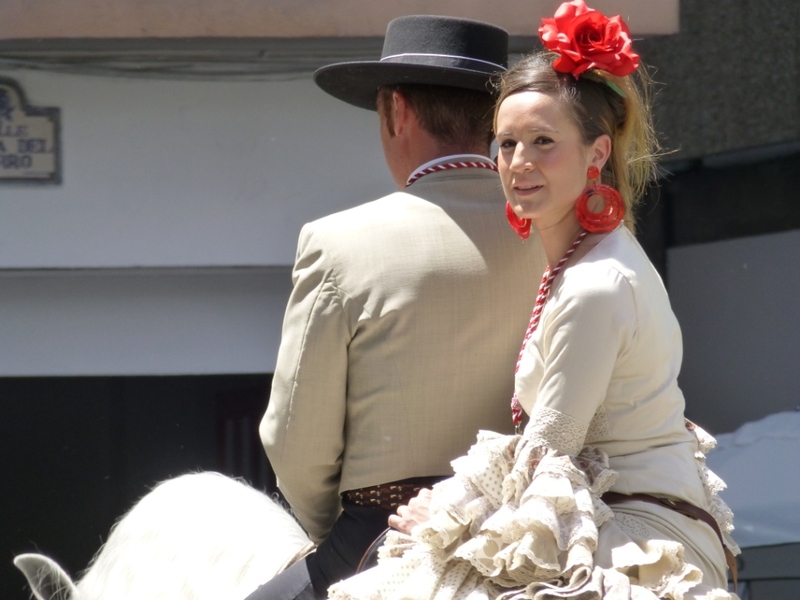 Riding on horseback through Granada, as in the good old days. It was amazing how much smell only a few horses can generate. Back in the day European cities must have been stinky places! Fortunately, bicycles have replaced the horse as the preferred non-motorized transport of the modern age. They are decidedly less stinky. Parece que la chica de arriba está en buenas manos. Montando a caballo en pleno centro de Granada, como en los viejos tiempos. Era sorprendente el olor que unos pocos caballos podían generar. Europa debió ser un lugar oloroso en algún momento de la historia! Por suerte las bicis han reemplazado a los caballos en el transporte no motorizado de la edad moderna. Son sin duda menos apestosas!